If an airbag has been deactivated, it should be reactivated as soon as possible so that it can continue to give the required protection. 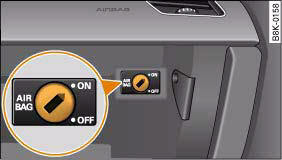 The key-operated switch for deactivating the front passenger's airbag is located in the glove box ⇒ fig. 222. 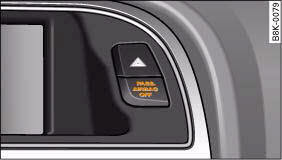 – To deactivate the front passenger's airbag, insert the ignition key into the switch and turn it to position . – The front passenger's airbag can be reactivated by turning the key to position . If you have no alternative but to install a rearward-facing child safety seat on the front passenger's seat you must deactivate the front passenger's airbag beforehand. We recommend, however, that child seats should be only fitted on the rear seat so that the front passenger's airbag can remain functional and provide protection in an accident. The airbag warning lamp will light up for a few seconds every time the ignition is switched on. If the front passenger's airbag has been deactivated via the keyoperated switch, the indicator lamp “PASSENGER AIRBAG OFF” will light up constantly as a reminder ⇒ page 209, fig. 223. Please refer also to the description of the warning lamp in the instrument cluster ⇒ page 17. When the front passenger's airbag is deactivated using the keyoperated switch, the seat belt warning lamp for the front passenger is also switched off. • If you have deactivated the front passenger's airbag, reactivate it as soon as the child seat is no longer needed so that the airbag can continue to give the required protection. • It is the driver's responsibility to ensure that the key-operated switch is set to the correct position. All the other airbags in the car will remain functional if the front passenger's airbag has been deactivated with the key-operated switch.